X P E R I M E N T - a computer game that allows us to play out the relationship between MAN and WOMAN. When the young woman discovers that she is pregnant, the relationship reaches a critical stage. HE is not willing to abandon the easy life of beer, bed and TV in this paradise for an uncertain future in an unknown place. They break up - and SHE breaks out of the room. But HE hadn’t reckoned with loneliness. Anxious and curious, HE sets out to look for HER - and breaks out, too. Eventually finds HER in a barren, apocalyptic desert, HER and the baby she’s just given birth to ... HE can’t face it. Panics - runs away - JUMPS. Evaluation of the Xperiment: Highly probable... End of demo version. Do you want to play for REAL? As every party comes to an end, we see HIM, drunk and sentimental, heading home - to his woman and child. Could it be a malfunction of the program? 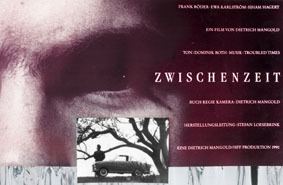 The 70 min feature, set in a small village in Southern Germany, tells the story of 10-year-old MORITZ, his mother MARIE - the local inn keeper - and his great uncle WAGNER, the village organist. MORITZ has lost his father in a car accident. But to him his father isn't dead! The sensitive boy endures by living in his very personal fantasy world in which his father is away on a great, great journey through exotic countries and will return home very soon. Every time MORITZ plays with his fantastic toy railway in the attic, every time the heavy passenger train blows its whistle as it embarks on a journey over vast Indian plains, through magical glas forests and metalliferous mountains, MORITZ can feel his fathers presence. Is able to share all his feelings with him. All of MARIE's tentative efforts to make her son understand harsh reality are bound to fail, especially as WAGNER, the cranky village organist and the boy's only true friend refuses to help her. Instead, old WAGNER is absorbed in a hopeless struggle against the other villagers: he fights for the overdue restauration of his beloved organ. MORITZ' anxiety grows more and more as he is haunted by terrible nightmares. 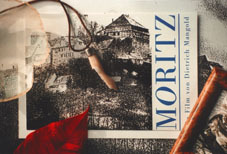 Finally he can't avoid the confrontation with truth any longer: MORITZ has to accept the reality of his fathers death - his whole world is in shatters.